This works very well for the client team that is deeply involved in the nitty-gritties of product development, but the extended stakeholders of the product usually don’t have the time to access JIRA and monitor the progress. We realized that we needed a better process that would get everybody on the same page, in a very simple manner. The need for such a report became even more urgent when we faced challenges with projects that involved multiple departments from a client company. Because there was no single point of contact for Srijan from the client team, a lot of tasks ran the risk of missing their deadlines, because of multiple dependencies on the departments. And we realized that this was just giving room to unproductive finger-pointing, taking the focus away from project and business outcomes. To overcome these issues, we decided to have Agile project reporting that could address budgets, release level, sprint level, risks identified, and the mitigation plan. We decided to implement the Red-Amber-Green status reporting process. A status mail goes out to all stakeholders of a product team, which starts with the color of the status: Red, Amber, or Green. GREEN: When the status reads Green, it means that the product development is on track for budget, scope, time and more importantly - the team is working well to deliver high business value features every sprint to get feedback from stakeholders. There are no risks or dependencies foreseen. Things look well within the scope of the sprint defined. AMBER: The Amber status indicates that some problem has been identified, for which an action is being initiated or help is being sought. The objective of the status report is to find ways to enable the status to go back to Green. Amber serves as a warning to everyone involved. It could indicate that Srijan foresees a risk for which we may or may not have a mitigation plan. It could mean that we are behind schedule and that we need more resources. Or that we have the resources, but they are unavailable for a certain period. It could indicate that while there is a risk identified, we have the plan in place, which would kick into action in a couple of days, till which time the status stays Amber. It could indicate that the project is overshooting the budget. RED: A Red status usually will come up after several weeks of Amber status have gone by, and actions taken (or not) have led to the sprint going into the certainty of not completing its goals, or budgets being overrun. A Red status cannot come up as a surprise, in the majority of cases. Under each color, the internal Product Owner/Scrum Master lists down Sprint Summary and the details of the various tasks in the sprint, as well as the sprint burndown. Essentially, this status mail becomes a single view of the sprint. The senior management team at the client company no longer needs to access JIRA for an update. They take just a few seconds to see if the status is Green or Amber. If it’s Amber, they quickly review the risk identified, and whether their help is being sought. And they take the necessary action quickly to ensure that the status goes back to Green. 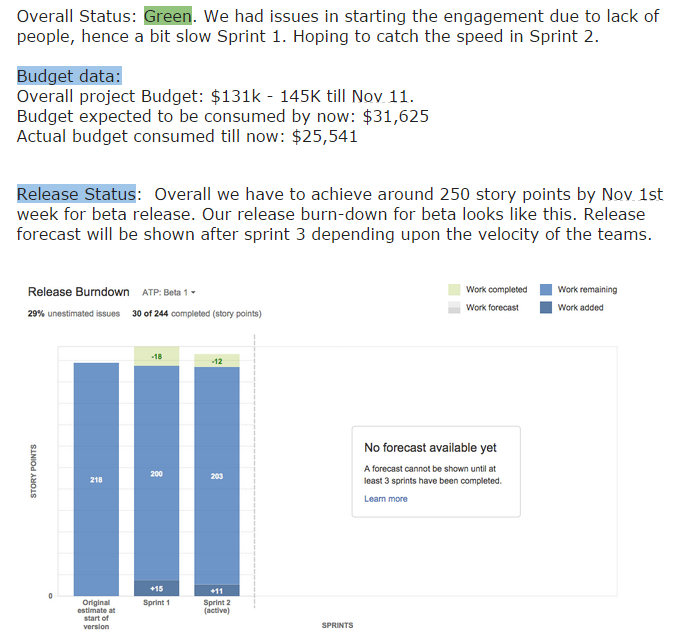 With this color-coded status reporting in place, Srijan has seen a marked difference in sprint completion success. As with most initiatives at Srijan, this status reporting mechanism is undergoing continuous improvement. We have now started including a snapshot of the Budget consumption as well. So if there are any changes related to budgets, it comes right up as it happens, rather than a key stakeholder getting to know about it much later in the product cycle. The color coded status report is also a way for Srijan to keep improving its capabilities, as each team member gets better with risk identification, forecasts and planning. The focus of every Srijan member then becomes more streamlined to the product success.